ComicKaze at Phnom Penh’s Living Room Cafe. Our Books, a local NGO that focuses on the development of comic art in Cambodia, organised what some said was the Kingdom's second comic drawing event last Saturday. The idea behind the initiative, referred to as ComicKaze, was to create a 24-page comic book within 12 hours, from concept to the final product. A collaborative effort with PulpFiction.net, an Australian online comic community, ComicKaze took place from 8am to 8pm at Cafe Living Room. The artists said they were trying to create comic profiles of themselves, detailing their daily lives to introduce themselves to their PulpFiction contemporaries. The event attracted more than 50 participants, including 10 local artists and about 40 students from the Aziza Foundation, an NGO that works with poor Cambodian children. 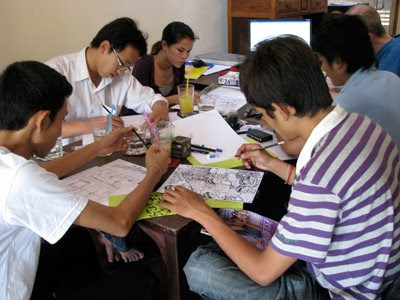 The mission of Our Books, which was founded in 2006, is to preserve Cambodia's comic arts. Though comics have been around in Cambodia since the mid-1960s, war interrupted the growth of this industry until the early 1980s, when comic books made an explosive comeback as an effective media tool. Comic art hit its peak in Cambodia in the early 1990s, but since then the local market has declined tremendously. 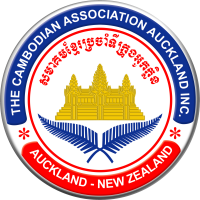 The spread of television and a lack of training in Cambodia could partially explain this decline, organisers say. John Weeks, managing editor of Our Books, said that many Cambodian comic book artists today view themselves as illustrators rather than just cartoonists. "In the West, you have the options to slot yourself into one particular role. Here, people just have to take up what's available," he said. Almost all the artists who participated in ComicKaze have multiple jobs. Chan Pisey, a comic artist, said that she has four freelance jobs, and on top of that she is currently working on her own comic. Moeu Diyadaravuth, staff member at Our Books and an artist, said he stays up to 2am almost every night to complete his freelance projects and his English homework and to work on his own comic project. In addition to that, the local comic market also fears global competition. "It's cheaper to translate comics [into Khmer] legally than to produce local work," Weeks said.To counter these obstacles, Our Books strives to keep the prices low, especially those of Khmer-language comics. In doing so, they minimise the threat of comics being bootlegged. Khmer comics are subsidised by the profits made from the sale of English and French versions, organisers said. Despite the constraints, participants in this year's ComicKaze project are optimistic about the future of Cambodia's comic industry. "I love what I do. I want to share my work with as many people as I can. That's why I joined this event," Moeu Diyadaravuth said, adding that in the next 5 to 10 years he hopes to establish a comic association to help young artists to meet other like-minded people. "[The role of Our Books] is to facilitate, not to direct," Weeks said. "Ultimately [the local artists] are the ones who determine what emerges through the drawing sessions. We provide the opportunities, and the artists take one step further to give us ideas to move forward in developing Khmer comics." This year, the 24-Hour Comic challenge will be celebrated globally October 3. In the past, the event has attracted more than 1,200 participants at official event locations in 17 countries around the world. "We will have a full 24 hours of comic drawing this time," said Weeks. The comic art produced during ComicKaze will be on display at Living Room Cafe until next month. my blog post stopwatch online.